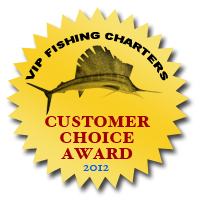 We are the fishing charter of choice for Fort Lauderdale conventions. Most fishing charter companies have only one boat. We have dozens of boats in our fleet which enables us to serve groups of all sizes. We offer a variety of special charters tailored to Fort Lauderdale conventions. One of our most popular charters for Fort Lauderdale conventions is our mock Fort Lauderdale fishing tournament charter. On one of our fishing tournament charters, we conduct a mock fishing tournament, where groups on different boats compete to win the tournament. We can customize the rules, but usually we have a contest of who can catch the most fish, biggest fish, or a specific type of fish. The mock fishing tournament is a great team building activity and helps participants bond. Our Fort Lauderdale fishing charters are located very close to most Fort Lauderdale convention venues and event venues. We're also conveniently located near most of the Fort Lauderdale hotels and resorts. We can help save Fort Lauderdale convention organizers time by taking care of all aspects of planning your fishing charter. We can arrange catering, transportation, or any other aspects relating to your group fishing charter.